Packed to the gills with crazy action, former stars, and massive carnage, Asylum’s Bigfoot is an entertaining SyFy feature that also doubles as political commentary. Bigfoot is relentless with action sequences, the very first shots are of various animals being devoured up the food chain, until we reach man shooting a bear. Man who is quickly taken out by a huge Bigfoot! 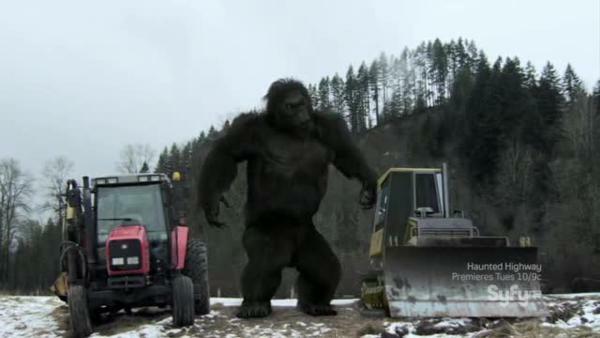 Bigfoot will run rampage through the local town of Deadwood, smashing cars, trucks, and chomping the heads off of people. 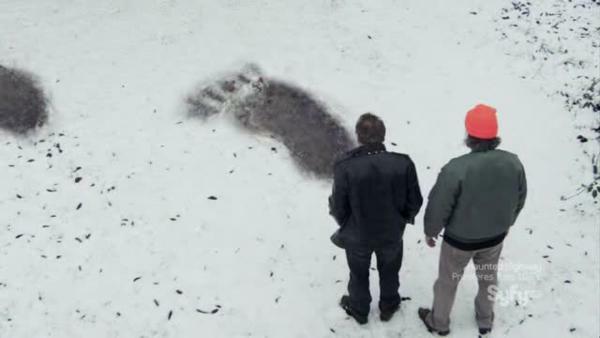 There is an energy in Bigfoot that keeps it chugging along, character dismissing any attempts to stop and think as they rush into one crazy plan after another, all while Bigfoot is smashing and eating. Bigfoot is a sequel in spirit to Mega Python vs. Gateroid. Like that film, it features two faded stars (instead of 80s pop icons Tiffany and Debbie Gibson, we have former 60s child stars Danny Bonaduce and Barry Williams) who argue constantly. The monster battle aspect has been dumped for just constant monster action. Bigfoot features more minor stars in supporting roles than MPvG, but both do feature a musical icon getting killed just after they appear (Micky Dolenz gets chomped in MPvG, while Alice Cooper gets punted in Bigfoot!) Even the ending is similar, but more on that in a little bit. Bigfoot is part of the Icy May series for MOSS – The Mysterious Order of the Skeleton Suit. And if you are wondering why something for May is showing up in June on TarsTarkas.NET, you must be new here! 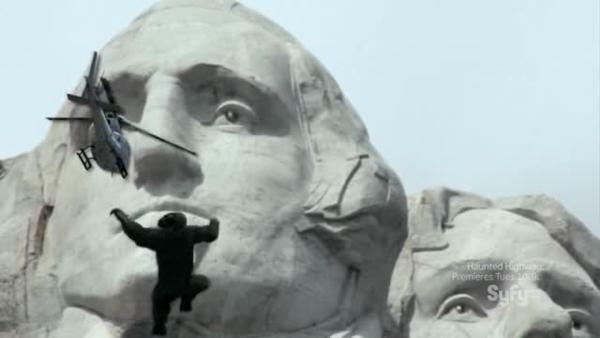 Heck, our March theme (March of Godzilla 2013) is still going on! Further Icy May entries include Gaddaar at both Beth Loves Bollywood and at FourDK, Yeti Curse of the Snow Demon at The Horror! ?, Snow Devils at Exploder Button, Fist of B-List meets The Iceman Cometh, and The Great Silence at Teleport City. Harley Anderson (Danny Bonaduce) – Former singer turned obnoxious disk jockey and thrower of ridiculous nostalgia concerts that both fail and cause angry beasts to awaken. Spends most of his time fighting his former partner turned rival Simon Quint instead of stopping the creature he helped unleash on the public. Simon Quint (Barry Williams) – Former singer turned gentle soul and friend of the Earth. He attracts a large following of young hot women and fights for the rights of nature. He attempts to subdue Bigfoot so he can be peacefully relocated instead of killed, but his attempts never pan out. Sheriff Becky Alvarez (Sherilyn Fenn) – A former detective in Oklahoma City, who has returned to her childhood home and joined the Sheriff’s department there. Attempts to stop the rampages of Bigfoot, despite objections from everyone for different reasons, and is one of the few characters more worried about the actual problem then about scoring points against the other side. 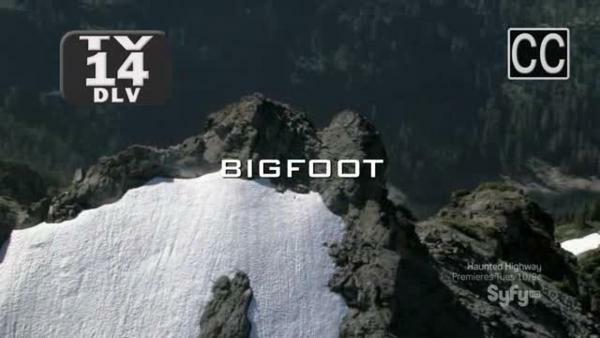 Bigfoot (CGI) – Angry huge furry guy who likes to bit off heads of passersby. Awoken from his hibernation due to noise from acres of trees getting chopped down, and is not too keen on this environmental encroachment. So he smashes up the local town. SyFy Channel in June is Monster Movie Heaven! June 9th brings us Jersey Shore Shark Attack. Check out your Snookies and J-WOWs vs ocean death, and pray that the Jersey Shore loses big time. Only sharks can save America from Snooki’s baby! Jack Scalia and Paul Sorvino star, while the Jersey characters have names like TC “The Complication”, BJ, J-Moni, and Nooki. John Shepphird (Chupacabra Terror) directs. Next week on June 16th is Piranhaconda – Jim Wynorski’s new flick about the Part Snake! Part Fish! All Killer! Michael Madsen and Rachel Hunter star, and the title alone is worth a view! The trailer recently popped up. June 23rd gives us Arachnoquake – the awesomely titled film where and earthquake causes giant albino spiders to get unleashed upon the Earth to attack Tracey Gold, Ethan Phillips, Bug Hall, and Edward Furlong. And finally June 30th gives us Bigfoot, which is notable because Danny Bonaduce and Barry Williams are following the Tiffany/Debbie Gibson route and teaming up for a SyFy film where they play rivals! Sherilyn Fenn, Howard Hesseman, and Alice Cooper also star. Needless to say, the DVRs are being set as we speak to make June the SyFyest month of them all!